Our mission is to rescue abused and neglected farmed animals, to restore them to health, and to provide them with a safe and loving forever home. We invite people to meet the animals and learn about the plight of animals raised for food and the benefits of a vegan diet for the animals, human health, and the environment. We are dedicated to spreading compassion and respect for all living beings. 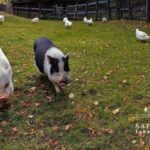 Donations and sponsorships are essential to helping us heal the hearts and bodies of our rescued farm animals and ensuring they enjoy the quality of life they so richly deserve.